Salman Khan was dragged into the ongoing political campaigning with Congress MP reportedly claiming that the ‘Dabangg’ star will volunteer to campaign or join their party. Clarifying his political intentions, Salman stated, “Contrary to the rumors, I am neither contesting elections nor campaigning for any political party.” Politics is not Pocket Hercules’ agenda and the actor is busy with a long list of projects coming up. He has wrapped up the shoot of ‘Bharat’, and will soon begin his cop film ‘Dabangg’, which will hit the screens in December. Salman will also be seen in Sanjay Leela Bhansali’s ‘Inshallah’, which he confirmed recently. 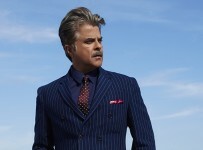 Anil Kapoor, the Indian George Clooney?